Product Range: 158 different products, including 135 finished medicinal products, 9 dietary supplements, 10 substances, 4 medical devices. Awards and Achievements: Phs-Leksredstva JSC ranks in the top-5 largest pharmaceutical manufacturers in Russia and actively participates in the state import substitution program. It is a perspective employer and one of the largest taxpayers in the Kursk Region. The Kursk Region State Labour Inspection has granted Phs-Leksredstva JSC “the Certificate of Trust” including into the list of employers ensuring observance of employee rights. Phs-Leksredstva JSC operates in compliance with the current environmental legislation of the Russian Federation. Its GMP standard implementation has resulted in two-fold reduction of industrial emissions. According to the results of the II Russian Industrial and Environmental Forum “RosPromEco-2014”, Phs-Leksredstva JSC was announced as the winner of the international “Environmental Tree” award in nomination of “The Best Environmentally Responsible Company”. Phs-Leksredstva JSC was second in nomination of “The best EHS company with 1000 and more workers” upon the results of regional competition of the best occupational safety and working conditions at the enterprises, entities and institutions of Kursk region, which was held in 2014. By the regional competition results in the Kursk Region, Phs-Leksredstva JSC won in nomination of “The best EHS company of 2015 in the chemical industry”. On December 15, 2016, A.N. Mikhailov, the Governor of Kursk region presented the awards to the winners of annual competition of projects “Innovation and invention of the year”. The project “Corvalol herbal tablets 0.58 mg + 14.00 mg + 8.20 mg and 1.16 mg + 28.00 mg + 16.40 mg”, developed by Phs-Leksredstva JSC, was THE FIRST in nomination “Innovative project”. In 2016, Phs-Leksredstva JSC was awarded the title of Laureate of Quality award of the Governor of Kursk region. Upon the results of operation during 2017, Phs-Leksredstva JSC became one of the winners “EcoWorld”, international award in the field of environmental protection. The company was awarded the Diploma of Laureate of category II in nomination “Environmental Policy and Environment”. On December 13, 2017, the Governor of Kursk region A.N. Mikhailov presented the awards to the winners of annual competition of projects “Innovation and invention of the year”. The project “Trombital film-coated tablets, 75 mg+15.20 mg and Trombital Forte film-coated tablets, 150 mg + 30.39 mg”, developed by Phs-Leksredstva JSC, was the third in nomination “Innovative project”. On December 3, 2017, the names of winners of “Healthy Food-2017” award were announced on the site of food festival “VKUSNO!” (Moscow). This award is presented every year to companies from healthcare and rational diet sector. The product “Ferrohematogen for children” became the winner in 2 nominations of “Healthy Food-2017” award: nomination “Functional Food” making part of category “School-aged children” and special nomination “Consumers’ choice-2017” upon the consumer tests conducted by “ROMIR” agency. pharmaceutical substances extracted from chemical raw materials. ensuring the storage in compliance with GMP. • Warehouse of packaging materials (Building No. 39). • Warehouse of finished products (Building No. 49), equipped with the systems for the finished products storage in compliance with GDP, GMP. Own local treatment plants, steam house, boiler house, water heating plant and access roads. The storage rooms of warehouse in Buildings No. 36, No. 39 are equipped with the following systems: HVAC, temperature and humidity monitoring, access control, automatic fire fighting, raw stuff addressed storage system. Storage rooms of the finished products warehouse, Building No. 49 are additionally equipped with the following systems: video surveillance, automated stock management system (ASMS). In 1963 Evgeny Prokhoda graduated from Tomsk Polytechnic University named after S.M. Kirov. Since 1979 he has held the position of General Director of Phs-Leksredstva JSC. Today he is known as the author of scientific discoveries, corresponding member of the Russian Academy of Natural Sciences, International Academy of Management, PhD in Economics and Management, active member of the International Academy of Ecology and Life Protection Sciences. In 2000 Evgeny Prokhoda was awarded the academic title of Professor by the Russian Academy of Natural History. Evgeny Prokhoda is a frequent winner of the “Manager of the Year” contest. On December 28, 2010, under the decree of the President of the Russian Federation, Evgeny Prokhoda was awarded the title “Honoured Chemist of the Russian Federation” for his contributions to the chemical industry and long and dedicated work. E. Prokhoda was awarded the title “Honored Citizen of the Kursk Region”. In 2015, E. Prokhoda ranked first in the Top-1000 Russian Managers rating, among executives of the pharmaceutical companies, released by the Association of Managers and Kommersant Publishing House. E. Prokhoda was awarded the title “Honoured Citizen of the Russian Federation” for his long and fruitful work contributing to the strengthening of national power, glory and prosperity. In 2016 Evgeny Prokhoda was awarded a medal “For assistance to blood donation” by instruction of the Federal Medical and Biological Agency of Russia. In the same year, E. Prokhoda was awarded the Certificate of Merit of the Chamber of Industry and Trade of the Russian Federation for a major contribution to the social and economical development of Kursk region and active cooperation with Kursk Chamber of Industry and Commerce. In virtue of the Order of the President of the Russian Federation No. 362-rp dated 17.11.2016, E. Prokhoda was awarded the Certificate of merit of the President of the Russian Federation in recognition of his input to development of healthcare, medicine and diligent work during many years. In 2017 Evgeny Prokhoda was awarded the Diploma of “Prizvanie”, national award presented to the best doctors of Russia, for the invaluable contribution to support the achievements of the Russian healthcare (awarded by V. Skvortsova, Ministry of Health of the Russian Federation, presented on 15.06.2017.). Establishment of the Kursk State Chemical and Pharmaceutical Plant (former name of Phs-Leksredstva JSC). It was established in the premises of the candle plant’s galenic production site. Relocated to a new site providing opportunities to expand the pharmaceutical product portfolio. Beginning of manufacturing of chemical substances for pharmaceutical industry. The finished drugs manufacturing, mainly based on the substances produced by the plant itself, was launched. Beginning of fundamental reconstruction for transition from the manufacturing of substances to manufacturing of the finished dosage forms. The manufacturing of following pharmaceutical products was started: Citramonum P, Validol, Corvalol, Pentalgin, Euphyllinum, Calcium gluconate etc. Launched manufacturing of syrups and suspensions for children compliant with the international standards, the first in the Russian Federation. Joined Pharmstandard Group. In 2004 it was renamed into Phs-Leksredstva JSC. 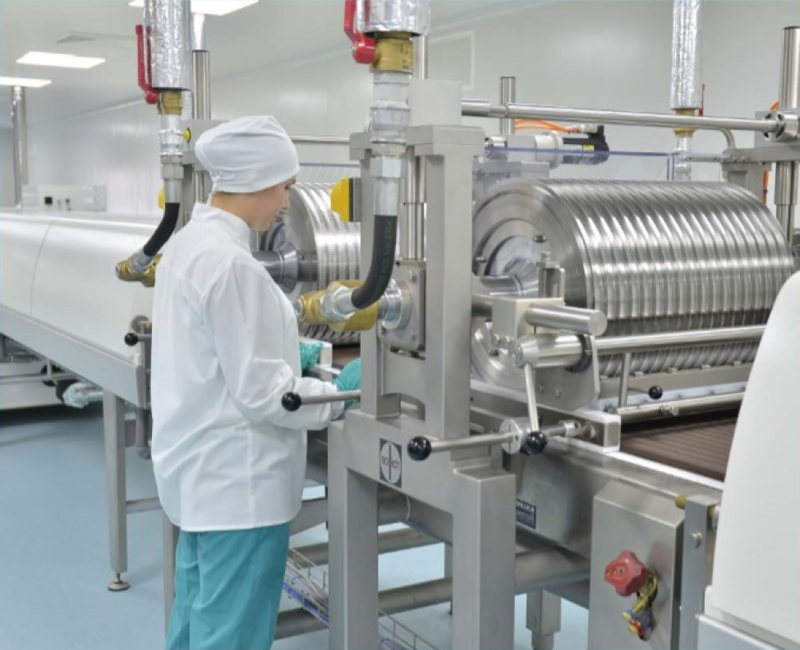 Constructed new manufacturing lines for solid dosage forms, sprays and aerosols and hard gelatin capsules. Obtained GMP Compliance Certificates for manufacturing of tablets and syrups. Mastered manufacturing of the new finished pharmaceutical products, for the most part are analogues of the imported medicinal products. Installation of air conditioning system for the storage rooms of the general plant warehouse at the 4th floor of Building No. 36. Installation of air conditioning system for the manufacturing of solid dosage forms in Shop No. 2. Construction of laboratory building (4th and 5th floors). In 2004 the industrial production of well-known brand, Pentalgin N tablets, started. After the inspection of the work site of solid dosage forms, conducted by the State Pharmaceutical Inspectorate of Latvia, the plant obtained the international GMP Certificate. The plant deployed the accounting information system, enabling online control over the use of the plant’s resources. In 2005, upon the inspection, the compliance by the work sites of solid dosage forms and liquid dosage forms with EU GMP requirements was confirmed. Commissioning of the Central Plant Laboratory, in compliance with GLP requirements. Launch of manufacturing facilities for production of the finished drugs in Building No. 16 (shop No. 4). Launch of manufacturing of aerosols and sprays in Shop No. 1. In 2006, the plant mastered manufacturing of 12 new drugs. In 2007, the plant mastered manufacturing of 17 new drugs. Launch of manufacturing of capsules, tablets and mixes using the organic solvents in Shop No. 3. Launch of a packaging site for drugs packaging in the form of powders (sachets) in Shop No. 4. Reconstruction of former air compressor house for manufacturing of tablets of the absorbent carbon. Launch of air conditioning system for storage rooms of the general plant warehouse at the 3rd floor of Building No. 36. In 2008, the plant mastered the manufacturing of 14 new drugs. In 2008 the plant received the Certificates of compliance with the European Union Good Manufacturing Practice (EU GMP) for 7 production lines, based on results of inspection, conducted at Phs-Leksredstva JSC by the State Drugs Agency of Latvia. In 2009 the plant mastered the manufacturing of 6 new drugs. The plant obtained Certificate of Manufacturer’s compliance with GMP requirements with respect to site No. 5 of Shop No. 3. In 2010 the plant mastered the manufacturing of 6 new drugs. The company was issued the Certificate of compliance by its quality management system with ISO 9001-2008 and with GOST R 52249-2009 (GMP). Put in commission the finished product warehouse of 11,500 pallet places with the GDP requirements. Put in commission the tablet film-coating area in workshop No.3 in compliance with the GMP requirements. In 2011 the plant mastered the manufacturing of 5 new drugs. The plant got next confirmation of compliance by the main areas of the plant (manufacturing of tablets, powders for suspension preparation, manufacturing of suspensions, sprays) with GMP EC requirements. Reconstruction of Shop No1 due to the launch of manufacturing of Codelac Neo, drops. Reconstruction of the finished products warehouse with separation of the storage room maintaining the storage temperature of 2-8 ℃. Reconstruction of Shop No. 2 with arrangement of the secondary package site for the metered-dose aerosols. Commissioning of the boiler house, with high performance factor of 92%, replacement of existing refrigerating plants by the more energy saving ones. Reconstruction of the checkpoint, deployment of the digital access system. In 2012 the company mastered the manufacturing of 9 new drugs. Reconstruction of Shop No. 1 due to the launch of the finished dosage forms manufacturing in form of sprays and aerosols. Reconstruction of the general plant warehouse of Building No. 36 (Room of raw stuff and materials sampling). Reconstruction of the laundry of the plant. In 2013 the plant mastered the manufacturing of 8 new drugs. The following certificates were received: Certificate of compliance by the manufacturing facilities with GMP of Ukraine; Certificate of compliance by the quality management system with GOST ISO 9001-2011 (ISO 9001:2008), GOST R 52249-2009 (GMP of the Russian Federation). Reconstruction of Building No. 43 with the launch of the manufacturing of dietary supplements in form of chewing pastilles (Hematogen) in Shop No. 6. In 2014 the plant mastered the manufacturing of 5 new drugs. The plant obtained the registration documents for a new drug Azithromycin tablets 125 mg, 250 mg and 500 mg. The plant mastered the new package type for the drug Pentalgin®, film-coated tablets, in Shop No. 4. Obtained the positive opinion from the State Drugs Agency of Latvia upon the results of inspection of GMP EU compliance. Reconstructed Corvalol (drops) preparation scheme in workshop No.1. Reconstructed the workshop No.2, commissioned the new manufacturing area for metered-dose aerosols. Reconstruction of the finished products warehouse with separation of the storage room, maintaining temperature of 2-8 ℃. Reconstruction of site No. 5 of Shop No. 3 with deployment of the air conditioning system In 2015 the plant mastered the manufacturing of 14 new drugs. In virtue of Order of the Ministry of Industry and Trade of the Russian Federation dated 29.01.15 No. 127, the plant was issued the opinion of compliance with the principles of Good Manufacturing Practice No. GMP-003-000003/15 In June 2015, upon the results of inspection, the competency of the test laboratory of Phs-Leksredstva JSC (QCD) was confirmed and accreditation scope was extended. Commissioned the packaging area for the medical devices (test strips) in workshop No.6. Reconstructed the part of the premises in workshop No.3 with expansion of film coating site No. 6. Construction of packaging materials warehouse. Reconstruction of the general plant warehouse of Building No. 36 with creation of a room for storage of high-potent hormone substances (HPHS) In 2016 the company mastered the manufacturing of 21 new drugs. The plant got renewal of Certificate of compliance by the quality management system with respect to drugs development and manufacturing with GOST R ISO 9001-2015 (ISO 9001:2015) No. РОСС.RU.ИМ00.И0037 (dated 25.05.2016) The manufacturing site was certified as compliant with regulations of “Good Manufacturing Practice” (GMP of the Russian Federation), approved by the Order of the Ministry of Industry and Trade of the Russian Federation No. 916 dated June 14, 2013 (in version of 18.12.2015). The plant obtained the Opinion on compliance by the medicinal products manufacturer with regulations of Good manufacturing Practice No. GMP-0003-000100/16. The QCD laboratories are accredited as test laboratories in Russian Accreditation system of the Russian Federation. Reconstruction of site No. 2 of Shop No. 3 with the launch of filling and packaging of Trombital tablets in jars. Reconstruction of site No. 2 of Shop No. 2 (Citramonum). Reconstruction of the 1st and 2nd floors of the general plant warehouse with installation of air conditioning system. Reconstruction of Central Plant Laboratory building with creation of the small batches site, which was used as a basis for commissioning of own research and production complex for mastering of new drugs manufacturing, including import-substituting ones and original drug, test output of drugs for carrying out of preclinical and clinical trials, quality assessment and saving costs for the development of new drugs. In 2017 the plant mastered the manufacturing of 15 new drugs. The plant successfully passed next audit of compliance with EU GMP, 8 work sites, manufacturing the products supplied to EU market, comply with EU GMP. 2018 Launch of the manufacturing of pulmonary powders in Building No. 17. Reconstruction of Shop No. 3 site No. 2 (Plan 1) with replacement of equipment, in order to increase the production output. Reconstruction of Shop No. 2 (3rd floor) with launch of powders manufacturing (development of design documents). Reconstruction of liquid dosage forms manufacturing facilities in Shop No. 3 (expansion). Reconstruction of warehouse (Building No. 22). Upgrade of the waste treatment facilities. Construction of a cable line CL-6kV from substation 110/6kV "Lesnaya" to distribution hub DH-6kV of Phs-Leksredstva JSC. Mastering of manufacturing of 20 new pharmaceutical products.